The heart health-focused startup has been gaining recognition for its Deep Heart technology, which uses a deep neural network and machine learning to predict heart disease. The company got its start by integrating with Apple Watches and has since gone through a slew of validation studies. Most recently, the company published a study which suggests that when the Deep Heart technology is integrated with a wearable tracker it can detect diabetes and other medical conditions. The Deep Heart technology has also been shown to detect hypertension and sleep apnea, according to a study that was conducted by Cardiogram in partnership with UC San Francisco’s Health eHeart Study, and atrial fibrillation, according to a JAMA study published in March. 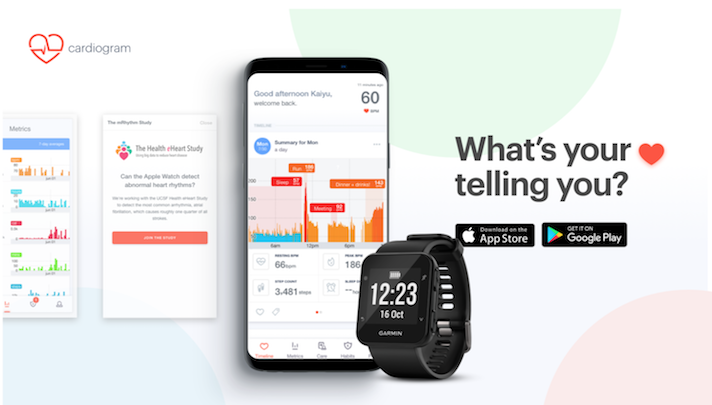 Garmin users now have the ability to connect their wearable to Cardiogram and get information about their heart rate, step count, and sleep data, which can automatically sync to their watch via the Garmin Connect app, according to a blog post by Cardiogram. When the app is integrated with Garmin it can be used in conjunction with android phones or with an iPhone. The blog notes that the iPhone only updates once a day but the company is working on making it sync more often.